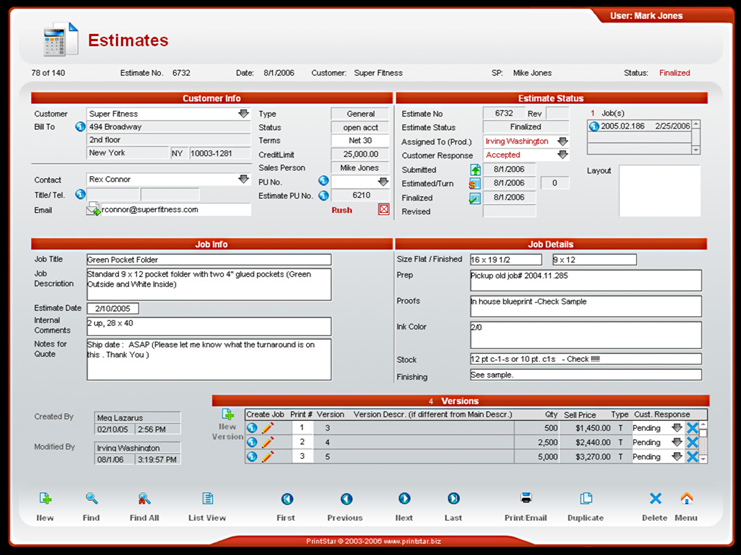 Easily create estimates with different quantities or versions under one master estimate. Easily duplicate estimates for repeat or similar jobs. Estimate costs for paper, printing (impressions or hourly), prepress, services & other. Easily apply markup and discount levels. Ability to assign Estimate requests to Production Department. Assigned Estimate Requests will flow to that person’s In Box for estimating, and back to Salesperson inbox when estimate is completed. All estimates can be signed with the account representative or estimator’s signature. Print and/or E-mail estimate (as PDF) automatically to Customer. Ability to track customer response to estimate. Easily Convert Estimate to a Job.